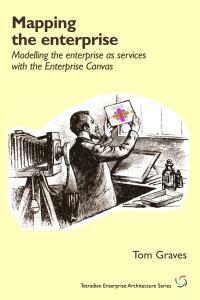 This part explores ideas and concepts for a core method for whole-enterprise architecture, and the implied support required within frameworks and methods. The methods we use at present for mainstream ‘enterprise’-architecture are kinda complicated, we might say? In a sense, they probably need to be, to find the right balance between Waterfall and Agile and the like, within a largely predefined scope, usually centred around some form of IT, and usually centred around the ‘business’-level to ‘logical’ level in that model layers of abstraction in the previous post. The emergent nature of design requires a non-linear approach to development. Which means that the methods we need for the kind of architecture-work we’re facing now and, even more, into the future, will need not only to work well with any scope, any scale and so on, but must have deep support for non-linearity built right into the core – yet in a way that fully supports formal rigour and discipline as well. To be blunt, of the very few current ‘EA’-frameworks that provide a method at all, probably none are anywhere near competent for this task. If we’re going to satisfy those requirements, it seems pretty certain that we need to go right back to first principles, and start again from scratch. And it’s not that far different from what we have in EA already. 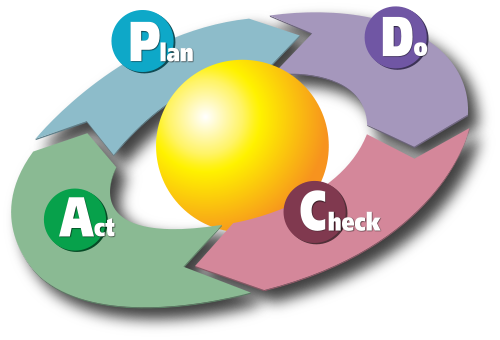 For example, the TOGAF ADM (Architecture Development Method is in effect a variant of a PDCA-loop: the ADM Phases B-D are sort-of equivalent to the PDCA Plan phase, ADM Phases E-G the Do phase, ADM H a rather incomplete Check phase, and ADM Phase A a largely-hardwired Act phase. So with some significant but doable amendments, it might at first seem as if we could perhaps hack something like the TOGAF ADM to do the job we need here. It starts with the initial seed of the idea – the purpose of the design-project. There’s then a wild swirl of uncertainty, iterating back-and-forth across many different options, opinions and more, before slowly settling out towards a distinct plan for action, and then putting that action into concrete form in real-world practice. In which case, we’ll use this as a proposed method for our framework for whole-enterprise architecture – and expand on how this would work in practice in the following ‘Application’ section. There’s a vast amount more that we could add to this, of course – but that’s probably enough for us to outline a first cut for a whole-enterprise architecture metamethod. From the above, we can derive suggested text for the ‘Methods’ section of a possible future standard for whole-enterprise architecture. Some of the graphics above might also be included along with the text. — Role of method: The purpose and role of the method is to support iterative sensemaking and decision-making within architecture-development for any or all of an entire enterprise or beyond. — Scope of method: The method must be able to self-adapt to any scope, any scale, any level, any domains, any forms of implementation, and for any architectural-type purpose within the respective enterprise. In part, this means that there needs to be a distinct phase within the method to identify the scope and purpose of the current iteration of the method. — Human-oriented focus: We define ‘enterprise’ as ‘a bold endeavour’ – an inherently human construct. Everything else in the enterprise – content, implementation, whatever – is subordinate to this human need and drive. In part, this means that there need to be distinct and explicit elements within the method that work with and acknowledge human feelings as well as functional system-behaviours and outcomes. — Explicit support for conflict-resolution: One consequence of a human-orientation for the method is a necessary acknowledgement of the inevitability of conflict and ‘Storming’ between stakeholders, and about matters of design, intent and more. In part, this means that there need to be explicit elements within the method that identify, work with and provide resolution for such conflicts. 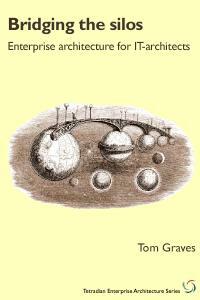 — Architecture and governance: Governance is an essential aspect of architecture-development, design, implementaition and deployment. 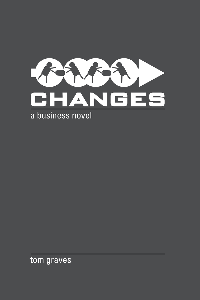 In part, this means that the architecture-method needs to embed and apply change-governance, to guide all of the stages throughout the change-lifecycle and beyond. 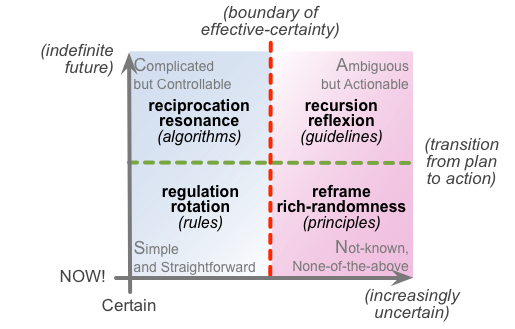 Since these will changes will have differing types and levels of complexity, lifecycle and other factors, this will necessitate support for a range of governance-types – from ‘waterfall’ to ‘agile’ and more – this implies that governance-support within the method would more take the form of ‘metagovernance’, from which any required form of governance could be derived. 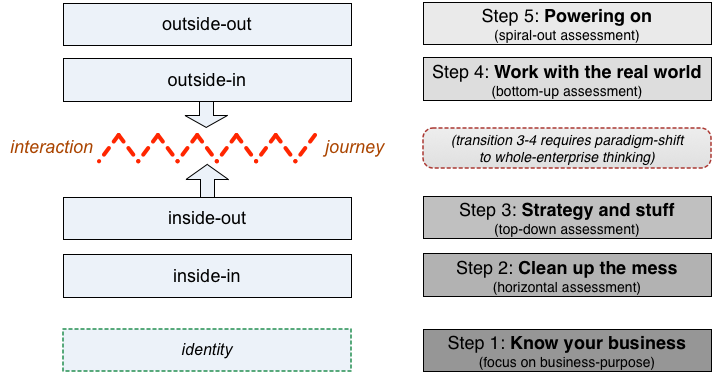 — Closure and continuous learning: The method, on completion of an iteration, needs to support assessment of benefits-realisation – to link back to the original purpose of the iteration – lessons-learned – to drive continual-learning and overall situational-awareness. — Support for fractality: The method needs to be able to support architectural-explorations across any scope, scale, domain and more. Such explorations will often occur as a result of questions arising from within other currently-active explorations, giving rise to a concept of recursive-nesting or fractality of architecture-iterations. The method must therefore be able to support fractality of itself within itself, to any required depth of nesting. 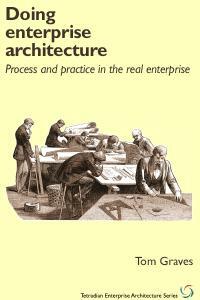 — Applicability and usability: One of the core concepts of whole-enterprise architecture is that architecture is everyone’s responsibility – not solely the province of those who describe themselves as ‘architects’. Because of this, the method needs to be usable by anyone, to any required level of complexity: it must be simple enough to be usable by an inexperienced trainee in frontline-operations, yet also be powerful enough to satisfy any professional needs. The most probable means to accommodate these requirements is a combination of a conceptually-simple frame, coupled with the power provided by fractality and by content-plugins, as described earlier above. — 1: Purpose [‘Forming’; Why]: Identify the underlying reason and scope for the session. What is the question (or ‘business-question’) that this architecture-session should address? What is the purpose here? What is the context for this session? – its scope, scale, level, domain(s) etc. What are the expected or required outcomes (if any)? for this session? What would be the expected guiding indicators of success or not-success for this session? 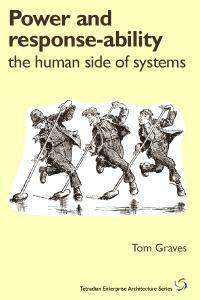 — 2: People [‘Storming’; Who]: Identify the people-issues in context of the session. What are their respective ‘response-abilities’ in this? Apply RACI, SEMPER or similar to identify: RACI positioning, power-issues (power-with vs power-against), and skills competencies and knowledge etc. What is the story that would link and unite all of these stakeholders and shared-supportive action within the shared-enterprise, in context of the scope of this session? Where conflicts between stakeholders either exist or are probable or possible, prepare for and apply appropriate conflict-resolution methods. — 3: Preparation [‘Norming’; How]: Prepare for action to address the needs in context of the session. What needs to be in place before taking action on this question? Given the constraints, use personal judgement(supported by guidelines where appropriate) to iteratively select and apply assessment-, sensemaking- and design-tools to make sense of and plan for the required activity. Where appropriate, optionally partition the exploration into distinct time-horizons such as ‘current state’, ‘intermediate state’, ‘future state’ and suchlike. Identify conditions at which ‘just enough detail’ will be achieved, and ‘just enough action’ may be enacted. — 4: Process [‘Performing’; Where / When / With-what]: Enact the intended action to address the needs of the question for this session. Follow the current plan of action. Record outcomes of action on action-records, metrics, etc. Reassess the plan on-the-fly as required, using tools such as OODA and SCAN for near-real-time reassessment: sense, make-sense, decide, act. Repeat until the required end-condition is reached. 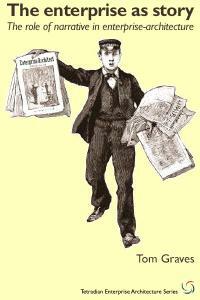 — 5: Performance [‘Adjourning’; Success]: Close the session, and prepare for any succeeding sessions. What was achieved in response to the question for the session? What benefits were realised, relative to the layered purpose? What were any lessons-learned? Cycles may be nested to any depth, and may be interrupted at any point – take care at all times to keep track of the current status of each active session! 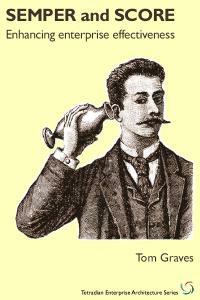 — Session duration and complexity: Sessions may be of any duration, nested to any depth as required. At its most minimalistic, a session might literally last a matter of seconds, using the Five Elements tag-lines as a quick real-time checklist. At a much larger scale, a nominal session could be the approximate equivalent of a multi-year TOGAF8-style IT-landscape rationalisation, containing a multitude of nested child-sessions within the overall architecture-development session, all of the sessions using the same Five Element pattern. Complexity of a session is largely a matter of choice and professional judgement, dependent on the requirements of the Purpose-question, the scope of stakeholders, the frames used in preparation, and the type of architectural action undertaken: again, this may be anywhere from minimalist to a massive multi-disciplinary project or programme of work. The key point here is that neither duration nor complexity are hardwired into any part of the Five Elements pattern: they are derived from how the pattern is used, not from the pattern itself. We’ll move on now to explore some ideas about how we could link specific content – or, more often, information about content – to the method, to guide architecture, design, implementation and real-world deployment. In the meantime, any further comments so far? Quick question, Tom. I scanned through your “Store in repository” steps, looking for something I could recognize as architecture descriptions. I see some references to ‘models’, as well as whiteboard images. 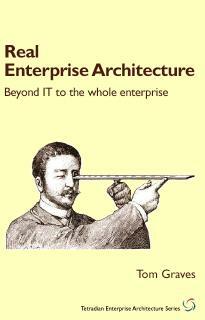 Am I missing something, or are you later going to talk about the joined-up descriptions of the architecture of the enterprise? Thanks, Doug. No, you’re not missing anything – it isn’t there yet, it’ll be included in Part 5. Getting things to join up properly, in a fluid, emergent, dynamic, fractal context, is going to be the hard bit – that part at least is certain. But we do need to be able to do it – otherwise much of this is going nowhere, at least in terms of the help we need from automated-tools. Going from overly-simplistic IT-only models that are essentially only for the specify/deliver phase, to true whole-enterprise modelling for the full development-cycle, will demand a huge change in how we tackle repositories for EA. More later in Part 5, anyway. Hi Tom — Apologies for thinking out loud on your blog. I hope this is not too much of an imposition. I’m thinking that there’s a corollary to your idea that things are better when they work together on purpose. The simple next step is to answer the questions “What things are we talking about?” “What do we mean by working together?” and “What is the purpose, and from who’s perspective?”. The corollary is that EA is the discipline that captures the structure of these ‘things’, he ‘working togethers’, and the ’embodied purposes’ in traceable ways that support all aspects of improved ‘workings together’. To my mind, this calls out for some notion of how that structure of architecture descriptions can be captured and used. And based on THAT, what are the methods for doing so? 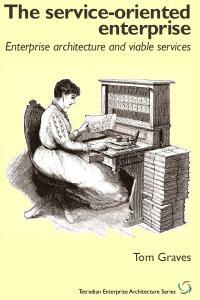 On “Apologies for thinking out loud on your blog. I hope this is not too much of an imposition” -it isn’t, and no apology needed 🙂 – the whole point of this blog (and perhaps particularly this series of posts) is that we should keep pushing forward the thinking on EA and related themes. And do so collectively – I wrote the initial post in each case here, sure, but it’s essential that it’s not only about me! 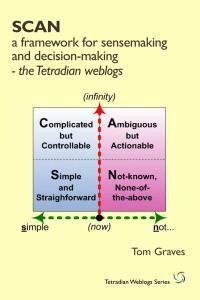 On “The simple next step…” etc, I’ve written about all of that extensively on this blog – perhaps particularly in the ‘Selling EA’ series. Perhaps have a quick look there first, and then come back here? On “calls out for some notion of how that structure of architecture descriptions” etc, that’s the basis for ISO42010, isn’t it? And for ADLs (Architecture Description Languages) that draw on it? The methods for the technical-oriented ADLs are fairly well-defined by now; it’s the other ADLs beyond the purely technical domains that this series and its underlying proposals are all about. Thank you. EA is gradually being brought to real life here. Thanks again for defining a powerful, yet simple method! 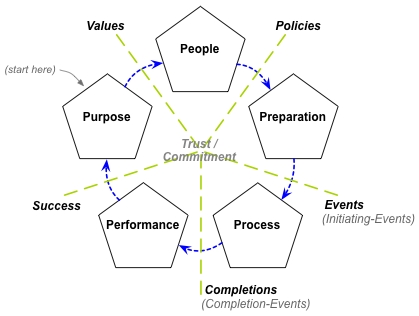 My question – How do we ‘integrate’ that method into a Project Management framework? Have you blogged about this at all? Of course, not all architecture work is ‘project-based’ work. 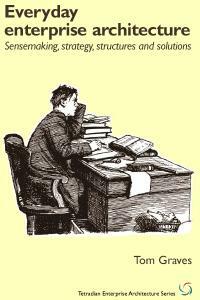 However, let’s say we *are* doing project based work. Clearly, we have some overlap between the method you describe here and the this ‘kick-off’ step in the PMO process. The ‘Purpose’ step in the architecture method would probably align with much of item 1 above and ‘People’ with much of item 2. One concern is that often (not always, of course) a project manager whose primary focus may be on-time/on-budget may not do much of the work you mention in those first 2 phases. Business Question – PM would probably do an OK job. Although probably unlikely to apply ‘Five whys’. Alignment with big-picture enterprise vision (3 steps up from the immediate context) – PM probably won’t do this well or at all. Expected Outcomes – PM may do well in a direct transnational context. Stakeholders – PM probably focuses on immediate team of stakeholders to deliver the project. Unlikely to apply ‘Five Whys’. 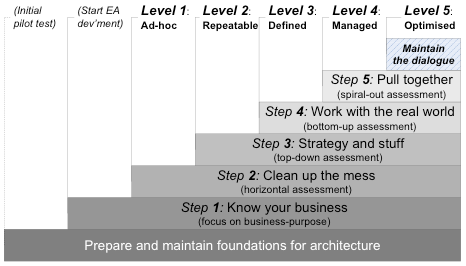 Architect, in contrast, should include stakeholders 3 levels up. RACI/SEMPER – PM may do well. Communications-plan, engagement-plan – PM may do well. – PM unlikely to do. (Side question – do you mean WRITING the story here, or just *identifying* the story and not actually writing it until the “Process’ phase? Similarly, in the PREPARE phase. Constraints on ‘just enough detail’ for preparation – PM unlikely to do. One concern is trying educate a PM is unlikely to be successful. To a PMO, once the Project ‘Kick-Off’ document is complete and signed-off, the process move from ‘Discovery’ phase to ‘Planning & Design’, and then to “Development’. So the question remains – how do we integrate architecture into a PM process? Taking an example of PM kick-off document, overlap/partial completion of tasks happen right away as I outlined above. Perhaps one way is to let the PM fill out their ‘kick-off’ document and then let the architect begin the Purpose and People phase, repeating much – but not all – of the same tasks that the PM did in the kick off document? So, in the project management life cycle process that the PMO defined, perhaps it’s first PMO Kick-Off Document and then Architecture Purpose and People and Preparation phase? 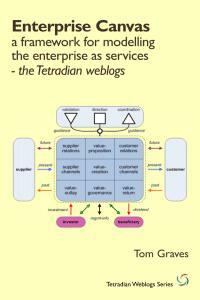 1 Pings/Trackbacks for "Towards a whole-enterprise architecture standard – 3: Method"